He had, he said, detected “certain motions in the medium that fills space, and measured the effects of these motions.” The results of the experiments had led him “inescapably” to the conclusion that such bodies as the sun are taking on mass much more rapidly than they are dissipating it by the dissipation of energy in heat and light. I entirely agree with what Tesla said. Tesla’s conclusions are entirely vindicated by the predictions of subquantum kinetics. Subquantum kinetics predicts that all stars, including the Sun, are creating matter in their interiors as well as genic energy (energy produced by photon blueshifting). As a result they are growing. Unlike conventional theory which predicts that stars will eventually burn out, SQK predicts that stars will continue to grow in mass and energy output, either ending in a supernova explosion or continuing their evolution in the form of a stellar core mass that is subject to occasional explosive outbursts. Tesla’s conclusions were controversial because they flew in the face of the law of energy conservation which physicists staunchly adhere to even today. There have been several observational confirmations of the matter/energy creation predictions of SQK. But it is interesting that Tesla claimed to have made observations prior to 1934 which led him to the same conclusion. From his quote, one is led to conclude that he was somehow making measurements related to the ether. What the instruments were and what the data was was never disclosed. It possibly was confiscated along with much of his apparatus at the time of his death 9 years later. There are other similarities between Tesla’s physics and subquantum kinetics. a) Tesla believed in the existence of an ether that filled all space. But this was an incompressible solid ether such as that proposed in the nineteenth century. His consisted of “independent carriers immersed in an insulating fluid.” This analogy comes very close to that of the subquantum kinetics ether which postulates a chemical-like medium consisting of reacting units (or etherons) that may independently diffuse through the medium or react with other etherons in the medium. b) Tesla envisioned that the ether is acted upon by the “life-giving creative force.” This comes very close to the animated ether of subquantum kinetics which continually engages in reaction processes proceeding forward as if animated by some Prime Mover. c) Tesla believed that when the ether was thrown into infinitesimal whirls it formed ponderable matter. In a similar fashion, the dissipative solitons that emerge from the Model G ether reaction system, which SQK postulates to be the analogs of subatomic particles, are predicted to contain ether vortices in their cores. d) Tesla believed that when the creative force subsides and this motion ceases, matter disappears leaving only the ether. This too parallels with SQK which notes that if the etheric reactive flux were to subside or change, matter would dematerialize. e) Tesla envisioned wave transmission as being analogous to sound waves traveling through a gaseous medium; i.e., alternate longitudinal compressions and rarifactions of a gas-like ether, and not transverse stresses in an incompressible fluid medium. This accurately describes the subquantum kinetics wave model which envisions waves as high and low etheron concentrations propagating longitudinally from the wave’s source. f) Tesla was against the general relativistic idea that matter could curve space. Similarly, SQK does not ascribe to this either, but postulates that space remains Euclidean throughout. Stars that are about 6,000 light years closer to the Galactic center than the Sun were found to be moving away from the Galactic center at a speed of about 10 km/second relative to the solar system. At this relative speed they would reach our radial distance in about 180 million years. According to one estimate, the Sun is traveling towards the Galactic center at about 10 km/s. So stars at this 6000 light year distance would be stationary relative to the Galactic center. However, the study found that there was a radial velocity gradient of about 3 km/s per kiloparsec with the radial velocity towards us increasing with increasing distance toward the Galactic center. If this trend were found to continue for distances closer to the Galactic center, stars at a distance of 3000 light years from the GC would be moving radially away from the GC at around 20 km/s, which means they could reach the Sun’s radial distance in about 300 million years. If future measurements bear out that stars in the inner portion of the Galaxy have a net a net radial motion away from the Galactic center, this would support the subquantum kinetics (SQK) continuous creation theory which predicts that spiral galaxies should be gradually growing in size due to the ejection of matter being continuously created in their cores. Central black sphere indicates the size of the hypothesized gravitationally lensed black hole event horizon compared to Mercury's orbit (inner circle). The white source inside indicates the comparable size of the observed microwave emission region. The blue sphere within that is the best estimate for the size of the Sgr A* mother star. Conventional astronomy has for decades maintained that the core of our Galaxy harbors a black hole singularity. The latest estimate places the mass of the core at 4.3 ± 0.3 million solar masses. Since its first publication in 1985, subquantum kinetics has maintained that black holes can’t form. It maintains that the massive objects in the cores of galaxies are instead very massive, very old stellar cores which are kept from collapsing by the prodigious amount of “genic” energy produced in their interior through the predicted photon blueshifting effect. Subquantum kinetics has maintained that Sgr A* is not a black hole, but a “mother star.” New observational evidence of the Galactic core that has been coming in favors this subquantum kinetics interpretation. Recently, it has been determined that Sgr A* has a diameter of just 37 micro arc seconds or 39 million km if we assume a Galactic center distance of 23,000 light years. This is about one third the diameter of Mercury’s orbit or 28 times the diameter of the Sun. By comparison, a 4.3 million solar mass black hole is calculated to have a Schwarzschild radius of 13.3 million kilometers and due to gravitational lensing the Schwarzschild event horizon should appear to us to have a diameter of 69 million km (5.2 times larger than the Schwarzschild radius). This would be about 56 percent the diameter of Mercury’s orbit. So the Galactic center is actually observed to have a radius almost half as large as is predicted by black hole theory. That is, radio emission is coming from a region which black hole theory predicts should be completely dark, from which light should not escape! Black hole theorists have tried to get around this by claiming that this radio emission is not coming directly from Sgr A* but from its immediate vicinity from a region close to the surface of its event horizon. But if this were the case, this emission region should be observed to orbit Sgr A* or at least rotate around Sgr A* participating in the rotation of the “black hole’s” event horizon envelope. But no such rotation is seen (see January 2011 article in Science News). If the black hole theory were correct, some degree of rotary motion would be expected since infalling material is theorized to add angular momentum to the black hole causing it to rotate. Instead, astronomers observing the emission from Sgr A* at millimeter wavelengths have determined that it is spinning either very slowly or not at all (http://arxiv.org/abs/1011.2770). Even if it had not “dined” in a while some amount of rotation would be expected to remain from its previous dining event. To explain its prodigious cosmic ray emission rather frequent mass accretion would be required. Finding matter in its immediate vicinity to accrete is another problem since its radiation pressure has swept this inner region clear of gas and dust. So the bottom line is that the black hole explanation for the Galactic center is in serious trouble. Anyone with an objective mind quickly realizes why the Sgr A* emission is not moving, i.e., not orbiting any hypothetical central mass; it is because the emission is coming directly from Sgr A* not from any hypothetical accretion disc. Since direct emission from within the gravitationally lensed Schwarzschild singularity is impossible according to black hole theory, we are lead inevitably to conclude that Sgr A* is not a black hole. It is a mother star, a very dense, primordial, energy-and-matter-generating stellar core. The best estimate gives it a diameter about 21.6 times that of the Sun, or about one-fourth the diameter of Mercury’s orbit. 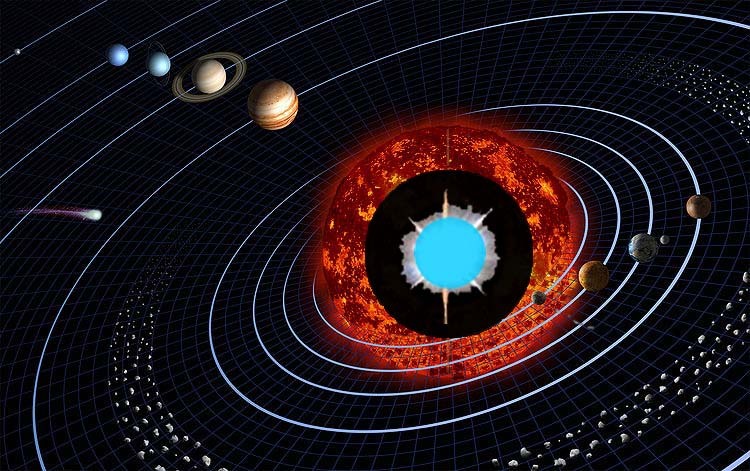 The mother star is shown as the blue sphere in the above image. For further details about mother stars see Subquantum Kinetics.